Bushmaster 90838 ACR Basic Folder Semi-Automatic 223 Remington|5.56 NATO 16.5 30+1 OR Folding Adjustable Synthetic Black Stk Black in. Bushmasters ACR Adaptive Combat Rifle redefines the term modular" with the extraordinary ability to change calibers barrel lengths and stock configurations in minutes without the use of tools. A versatile and adaptive rifle it was built specifically for law enforcement and commercial markets. Its tested and proven reliable in the most brutal conditions on earth. The ACR features fully ambidextrous controls including magazine release bolt catch and release fire selector and nonreciprocating charging handle. The highimpact composite lower receiver has a a textured magazine well and modular grip storage. The adjustable twoposition gas pistondriven system allows for suppressed or unsuppressed firing and the 16.5" cold hammerforged barrel is FNCtreated for maximum durability longevity and reliability. The folding multiposition telescoping stock has a rubber buttpad and sling mounts. 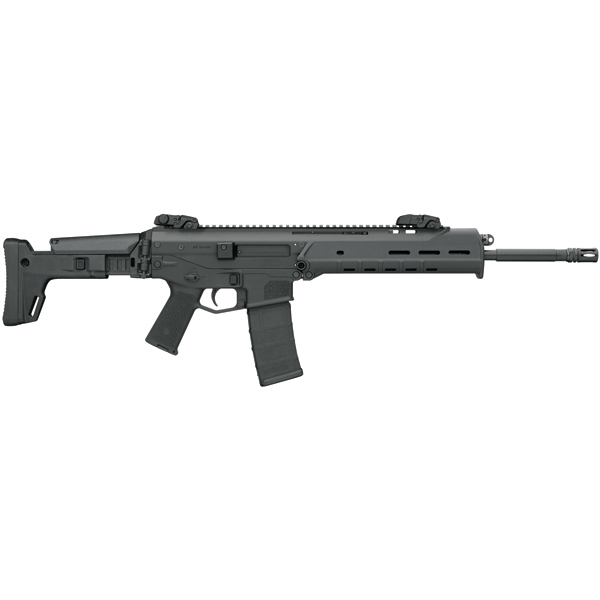 The Basic ACR has a highimpact composite handguard with a heat shield and accepts rail inserts and an AAC 51T flash hider."